Reverse Osmosis is a technology that is used to remove a large majority of contaminants from water by pushing the water under pressure through a semipermeable membrane. Reverse Osmosis, commonly referred to as RO, is a process where you demineralize or deionize water by pushing it under pressure through a semipermeable Reverse Osmosis Membrane. Below is a diagram which shows how osmosis works. A solution that is less concentrated will have a natural tendency to migrate to a solution with a higher concentration. For example, if you had a container full of water with a low salt concentration and another container full of water with a high salt concentration and they were separated by a semipermeable membrane, then the water with the lower salt concentration would begin to migrate towards the water container with the higher salt concentration. A semipermeable membrane is a membrane that will allow some atoms or molecules to pass but not others. A simple example is a screen door. It allows air molecules to pass through but not pests or anything larger than the holes in the screen door. Another example is Gore-tex clothing fabric that contains an extremely thin plastic film into which billions of small pores have been cut. The pores are big enough to let water vapor through, but small enough to prevent liquid water from passing. Reverse Osmosis is the process of Osmosis in reverse. Whereas Osmosis occurs naturally without energy required, to reverse the process of osmosis you need to apply energy to the more saline solution. 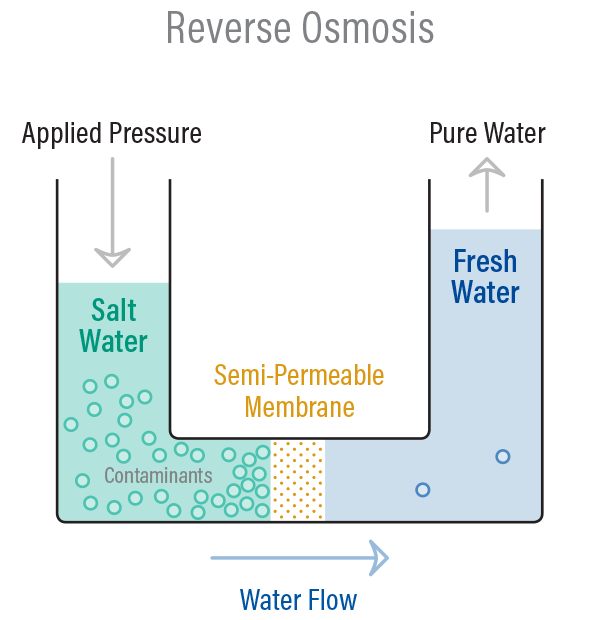 A reverse osmosis membrane is a semipermeable membrane that allows the passage of water molecules but not the majority of dissolved salts, organics, bacteria and pyrogens. 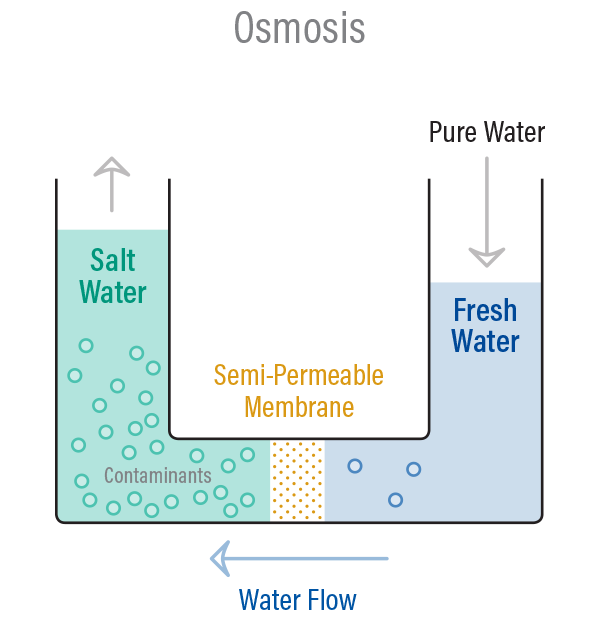 However, you need to ‘push’ the water through the reverse osmosis membrane by applying pressure that is greater than the naturally occurring osmotic pressure in order to desalinate (demineralize or deionize) water in the process, allowing pure water through while holding back a majority of contaminants. 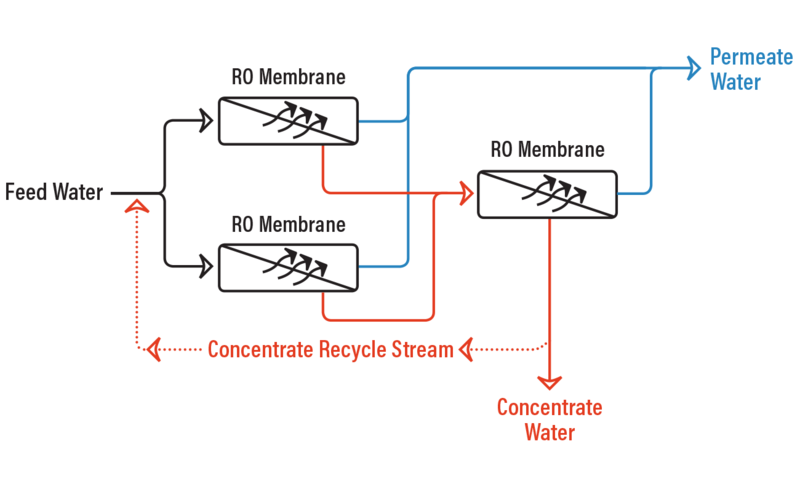 Below is a diagram outlining the process of Reverse Osmosis. When pressure is applied to the concentrated solution, the water molecules are forced through the semipermeable membrane and the contaminants are not allowed through. Reverse Osmosis works by using a high pressure pump to increase the pressure on the salt side of the RO and force the water across the semipermeable RO membrane, leaving almost all (around 95% to 99%) of dissolved salts behind in the reject stream. The amount of pressure required depends on the salt concentration of the feed water. The more concentrated the feed water, the more pressure is required to overcome the osmotic pressure. 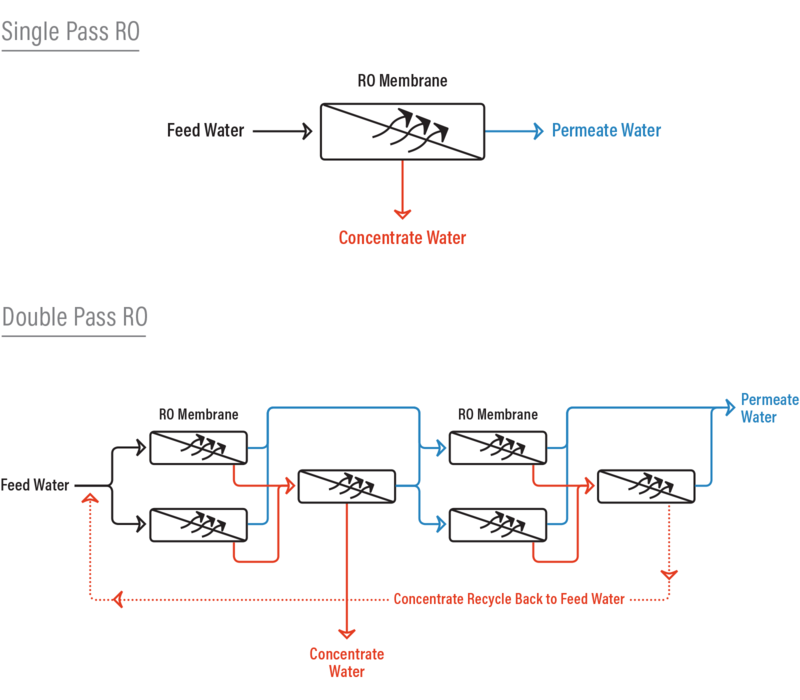 As the feed water enters the RO membrane under pressure (enough pressure to overcome osmotic pressure) the water molecules pass through the semipermeable membrane and the salts and other contaminants are not allowed to pass and are discharged through the reject stream (also known as the concentrate or brine stream), which goes to drain or can be fed back into the feed water supply in some circumstances to be recycled through the RO system to save water. The water that makes it through the RO membrane is called permeate or product water and usually has around 95% to 99% of the dissolved salts removed from it. What contaminants will Reverse Osmosis remove from water? The terms stage and pass are often mistaken for the same thing in an RO system and can be confusing terminology for an RO operator. It is important to understand the difference between a 1 and 2 stage RO and a 1 and 2 pass RO. Microorganisms (bacteria, etc). Bacteria present one of the most common fouling problems since RO membranes in use today cannot tolerate a disinfectant such as chlorine and therefore microorganisms are often able to thrive and multiply on the membrane surface. They may product biofilms that cover the membrane surface and result in heavy fouling. 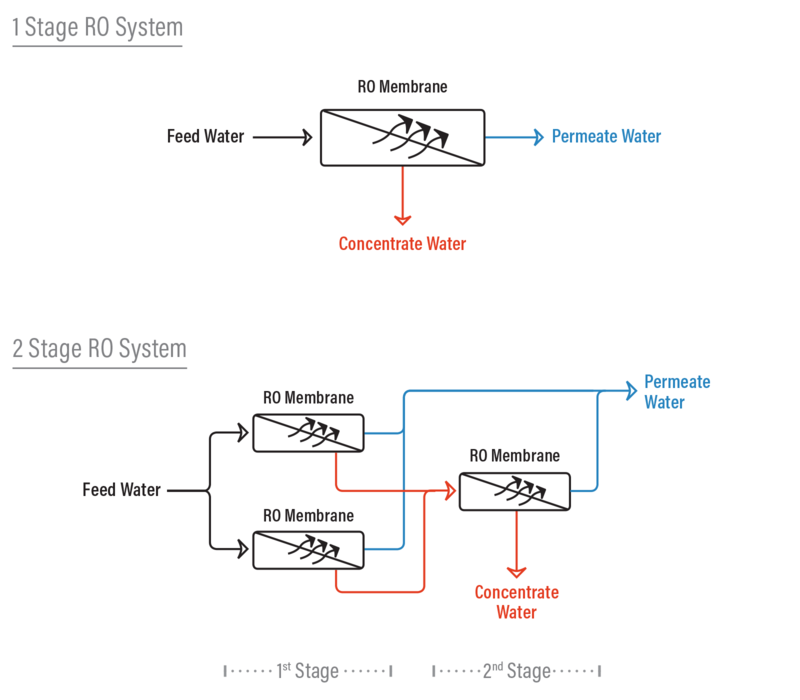 The RO membranes are the heart of the RO system and certain data points need to be collected to determine the health of the RO membranes. These data points include the system pressures, flows, quality and temperature. Water temperature is directly proportional to pressure. As the water temperature decreases it becomes more viscous and the RO permeate flow will drop as it requires more pressure to push the water through the membrane. Likewise, when the water temperature increases the RO permeate flow will increase. As a result, performance data for an RO system must be normalized so that flow variations are not interpreted as abnormal when no problem exists. The normalized flows, pressures and salt rejection should be calculated, graphed and compared to the baseline data (when the RO was commissioned or after the membranes were cleaned or replaced) to help troubleshoot any problems and also determine when to clean or inspect the membranes for damage. Data normalization helps display the true performance of the RO membranes. As a general rule of thumb, when the normalized change is +/- 15% from the baseline data then you need to take action. If you don’t follow this rule then RO membrane cleanings may not be very effective at bringing the membranes back to near new performance.